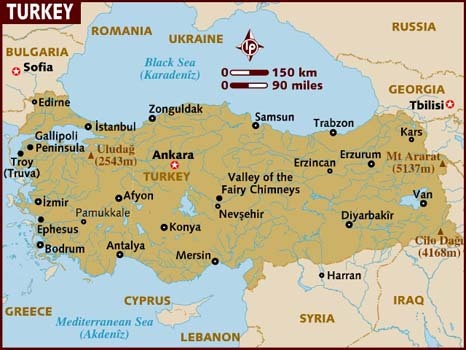 Turkey is a vast peninsula, linking Asia to Europe through the Sea of Marmara and the Straits of Istanbul and Çanakkale. Turkey neighbours on Bulgaria, Greece, Syria, Iraq, Iran, Armenia and Georgia, as well as the Black Sea, the Sea of Marmara and the Mediterranean Sea. The capital city is Ankara. The country’s shores are laced with beaches, bays, coves, ports, islands and peninsulas. 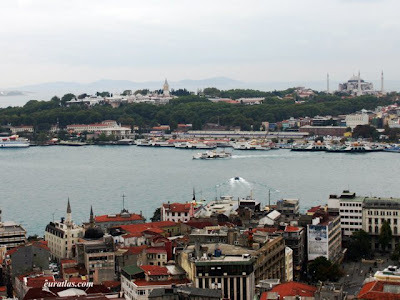 Turkey is blessed with majestic mountains and valleys, lakes, rivers, waterfalls and grottoes. At the same time, it is also rich in hot springs, as well as healing waters and muds. Due to its diverse geography, one can experience four different climates in any one day. Turkey is, above anything else, a huge open-air museum, a repository of all the civilizations nurtured by the soils of Anatolia. The huge amount of historical and archaeological wealth seems more appropriate for an entire continent than a single country. Turkey has 10 properties Inscribed In the UNESCO World Heritage List. Turkey's most pressing needs are for water treatment plants, wastewater treatment facilities, solid waste management, and the conservation of biodiversity. In the early 2000s, prospective membership in the European Union spurred the updating of some environmental legislation. 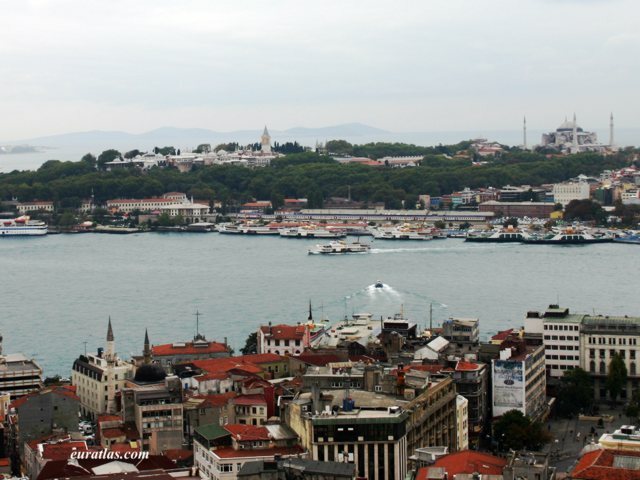 Among Turkey's principal environmental problems is air pollution in cities. This has accelerated since rapid economic growth began in the mid-1990s. The problem is acute in Istanbul, Ankara, Erzurum and Bursa, where the combustion of heating fuels increases particulate density in winter. Especially in Istanbul, increased car ownership and the slow development of public transportation cause frequent urban smog conditions. In the last years, significant reductions have been achieved in Istanbul and Ankara. Industrial air pollution comes mainly from power plants and the metallurgy, cement, sugar, and fertilizer industries, a large percentage of which lack filtration equipment. The nation's rivers are polluted with industrial chemicals. A large part of the population has access to safe drinking water. The potential for spills from the 5,000 oil- and gas-carrying ships that pass through the Bosporus annually is a challenge. The release of pollutants by neighboring countries has critically contaminated the Black Sea, and multinational cooperation has not adequately addressed the problem. Soil erosion affects both coastal and internal areas. Land degradation is caused by inappropriate use of agricultural land, overgrazing, over-fertilization, and deforestation. Serious soil erosion has occurred in 69% of Turkey’s land surface. The discovery of a number of chemical waste sites in 2006 has highlighted weakness in environmental law and oversight. In 2001, 15 of Turkey's mammal species and 14 of its bird species were endangered. About 1,600 types of plants were threatened with extinction. Endangered species include the Anatolian leopard, Mediterranean monk seal, bald ibis, slender-billed curlew, Atlantic sturgeon, and hawksbill and green sea turtles. As a result of climate change, Turkey may experience increased temperatures including heat waves, increases in forest fires, decline in agricultural productivity, loss of surface water, and a loss of biodiversity. While an overall decrease in precipitation is expected, the intensity of rain when it does occur can cause flooding. Despite its growth in the recent decades, Turkish citizens remain rather disconnected from the civil society movement. Citizen participation is characterised by a narrow and deep trend where different social groups such as young people, women and ethnic minorities are under-represented. Only 4.5% and 5.3% of the population are members of social and political CSOs respectively, while only 2.5% and 4.2% provide volunteer support to social or political organisations. Donations to CSOs are also rather low in Turkey. But despite the narrow citizen participation in Turkey, those that do participate in civil society activities do so rather deeply and intensely. A significant percentage of citizens who are members or volunteers of one CSO are members of or volunteers in at least one other. In terms of the extent of civic participation, volunteering appears to attract the smallest part of the population. Furthermore, individual activism appears to be the most widespread form of civic engagement. The extent of civic engagement seems to have improved over the years. Numbers of association members have gone up from 4,326,248 in 2005 to 6,811,147 in 2008, showing a 63.5% increase. However, a large majority (87%) of CSOs find citizen participation levels insufficient and place the lack of participation second among their most pressing problems, approving the need for increased capacity and support in this area. Many stakeholders support the notion that the environmental CSO movement in Turkey is quite strong and in many ways has contributed to the development of the sector overall. They do also tend to be more organized (in terms of networks and platforms at the national and regional level) and have perhaps been one of the first CSO groups to engage in advocacy activities and legislative reforms. However, broad-based support and / or public visibility of such environmental initiatives are lacking. According to OECD there are about 8 environmental taxes in Turkey, among which 3 regard fuel and vehicles, 1 regards air pollution, 2 regard water, while the remaining 2 refer to noise and nature protection. There are also 4 environmentally motivated subsidies with the purpose of: waste minimization, environmental protection, promoting the use of lead-free gasoline and promoting investments in treatment facilities. Municipalities are authorized to collect an Environmental Tax as a contribution towards the financing of certain services such as garbage collection. This tax is levied at scheduled fixed amounts that vary according to the location of the house or office. This tax is paid through water bill of the property by the person who lives or occupies that house or office. The Turkish Industrial Strategy explicitly states that one of the key elements of competitiveness will be utilization of environment-friendly technologies in the close future. Besides, increasing share of renewables in energy sector is another priority to ensure energy supply security. The SME Strategy and Action Plan states that the public opinion has become more sensitive regarding the prevention of environmental pollution and protection of natural resources all around the world, leading to the preference of enterprises producing and products produced without harming the environment, and in this direction, SMEs have to integrate an operational culture based on environment friendly production in order to preserve their competitiveness. Under the provisions of Energy Efficiency Law, the Ministry of Industry and Trade has enforced the regulation on "Eco Design of Energy Related Products". A Draft "Energy Efficiency Strategy Paper 2010-2023"is also under preparation. The Law on Utilization of Renewable Energy Resources for the Purpose of Generating Electrical Energy is one of the important laws concerning energy resources. Energy Efficiency Law was published for the purpose of increasing efficiency in the use of energy and energy resources in order to efficiently use energy, prevent extravagance, alleviate the burden of energy costs on the economy and protect the environment. Under the “Hand-in-Hand ENVER (Energy Efficiency) Movement”, a step of National Energy Efficiency Movement, energy saving lamps have been distributed and awareness raising activities have been performed at primary schools. The private sector is generally uninterested in civil society actors. Major companies show limited concern about the social and environmental impacts of their operations and CSR activities, and only a very limited range of CSOs benefit from CSR activities. However, companies are taking a more active role in supporting CSOs. Yet concerns remain about the lack of strategies and mechanisms. CSO partners and projects are selected and supported on an ad-hoc basis, generally with the advice of public relations/corporate communications consultants, commonly funded from the companies’ PR or marketing budgets. Decisions are rarely made according to any set guidelines and the practice is often treated as a ‘sponsorship’ rather than a ‘grant’. As such, corporate funds are accessible only for small and selective groups of CSOs. The unfavourable fiscal framework for donations and grant giving appears as another factor affecting CSR and corporate philanthropy negatively. There are also firms and CSOs in Turkey which integrate CSR initiatives into their daily operations and fulfill CSR’s notion in line with globally accepted principles. As best practices are communicated at different platforms, they will inspire and act as role models for further business and civil sector partnerships, which will be beneficial for both parties.